Electrical packages: basic with a breaker box, 2 outlets, a switch, and a light ($350). Upgrades available. Insulation and line (starting at $1.75/sq. ft). 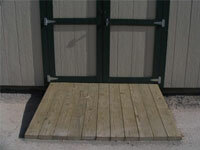 Overhead doors: 8’x6’6″ or 8’x7′ ($650), 9’x6’6″ or 9’x7′ ($675); 6’x6’6″ or 7’x6’6″ ($675). These prices include a walk-through door. Without walk-through door, deduct $80. 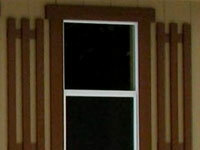 Windows: Single hung with a screen, aluminum frame: 2×3 – $80; 3×3 – $100. We also stock insulated vinyl windows that we use in our cabins. Ask about custom designs to fit your needs. 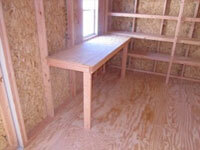 Tongue-and-groove 3/4″ Advantech flooring, more water resistant than plywood. 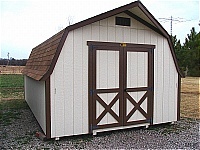 We use it on our cabins and portable garages, but you can upgrade for $10/sheet. Reflective decking for the roof keeps your building cooler. Just $6/sheet. Roofing: Our Malarkey Highlander 30-year shingles are nailed on, not stapled. Free delivery in Zone 1 within 30 miles of Perkins. Mileage charges may apply. add 10% to the Mini Barn prices. 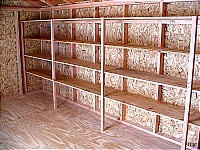 We can add shelves too! — and you own the building!